During the summer of 2017, Natalia ISD’s school nutrition team and summer meal program participants celebrated Farm Fresh Fridays with Texas-grown zucchini, cucumbers, tomatoes, and fresh jalapenos. The vegetables were sourced through a partnership with two local farmers. One Farm Fresh Friday celebration coincided with Natalia ISD’s kick-off event that was hosted at a park across the street from the school. The staff used a large barbecue pit at the park to grill hamburgers with the fresh jalapeños. The jalapeños were sliced, de-seeded and stuffed with low-fat cream cheese. The stuffed peppers were topped with turkey bacon and grilled for a healthy twist on a traditional jalapeño popper. They were a hit with all students. “All were eaten with requests for more,” said Child Nutrition Director Joey Moczygemba. 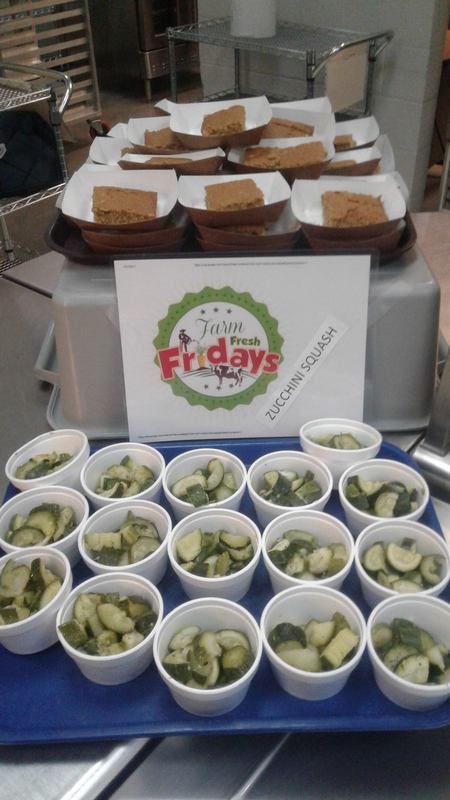 During October, the nutrition team also served sautéed zucchini and zucchini bread to celebrate Farm Fresh Fridays. Two recipes used by the Natalia ISD team are available below. Clean and de-seed fresh, halved jalapenos. Sprinkle crumbled, pre-cooked turkey bacon on top. Grill until jalapenos are blistered and cheese is starting to brown on top. 1. Place flour, sugar, instant dry milk, baking powder, baking soda, nutmeg, and salt in a commercial mixer (batch as needed). Using the paddle attachment, mix on low speed for 1 minute. Leave dry ingredients in mixer. Set aside for step 3. 3. Add shortening and egg mixture to dry ingredients. Mix for 30 seconds on low speed. Beat for 1 minute on medium speed. 5. Pour 1 qt 2 cups (about 3 lb) batter into a half steam table pan (12” x 10” x 2 1/2 “) lightly coated with pan release spray. 6. (Optional) Sprinkle coconut flakes on top of banana mixture before baking. 7. Bake until golden brown: Conventional oven: 350 °F for 35-45 minutes. Convection oven: 300 °F for 25-35 minutes. 8. Portion: cut each pan 5x5 (25 pieces per pan).